Leaders of Ukraine, Russia, France and Germany are expected to gather in Minsk, Belarus, for what is widely viewed as a last attempt to stop the violence in Eastern Ukraine. The talks come as deaths continue to pile up in the civil war-torn nation. Wednesday’s meeting in Minsk has drawn worldwide attention, with some 400 journalists covering the event. Even on Wednesday morning there was no certainty that the talks would actually go as planned. "There are a number of problems which remain to be resolved ... but it is very likely to go ahead," French Foreign Minister Laurent Fabius told France Inter radio. He added that "it is really a last chance negotiation." Later it was confirmed by the office of French President Francois Hollande that both he and German Chancellor Angela Merkel were going to Minsk for the talks. The Kremlin officially confirmed that President Vladimir Putin will participate in the meeting. Russian Foreign Minister Sergey Lavrov, who is going to Minsk as well, said he was certain that the talks would result in a political settlement of the conflict. “The experts are working. There is considerable progress,” the minister said, declining to reveal any details of the draft agreement. A Russian diplomatic source told Reuters that there was 70 percent chance that that the leaders of Russia, Ukraine, France and Germany would reach an agreement. "The presidents aren't traveling for no reason," the source said. Representatives from the Ukrainian rebel forces were not invited to the talks, but they are taking part in a separate meeting of the so-called “contact group,” which also includes Ukraine, Russia and the Organization for Security and Cooperation in Europe (OSCE). The group’s meeting on Tuesday saw no breakthrough, although sources familiar with the issue said that a ceasefire plan was agreed upon. The parties provided guarantees that the plan would be implemented if Wednesday’s negotiations produce concrete results, according to a RIA Novosti source. “Yesterday the parties agreed to stop fire and pull back the weapons. Kiev, for its part, guaranteed that. Representatives of [the self-proclaimed republics] declared that they guaranteed it as well,” the diplomatic source told. The rebels indicated that it would be up to Kiev to demonstrate a willingness to reach a peace deal. The self-proclaimed Donetsk and Lugansk People’s Republics reportedly want their latest land grabs amid escalated violence to be part of the peace settlement. Kiev apparently resists such demands and wants their opponents to fall back to where they were in early January. “The key position is ceasefire without any conditions,” Ukrainian President Poroshenko described his negotiating position on Wednesday at a cabinet session. He added that if no deal is reached, Ukraine will declare martial law, a move his government has previously rejected. “The cabinet, the parliament and I are all prepared to declare martial law,” he warned. The Ukrainian government wants to take back control of the land it lost after launching a failed massive offensive in January. The situation is not unlike that in August 2014, when a Russia and OSCE-brokered truce put an end to a string of military defeats of the troops loyal to Kiev. Some rebel officials accused Ukraine of agreeing to the first ceasefire only to build up their troops and prepare for a new crackdown. Poroshenko is going to Minsk a day after visiting Kramatorsk, a city where 16 people were reported killed from a rocket attack on Tuesday. 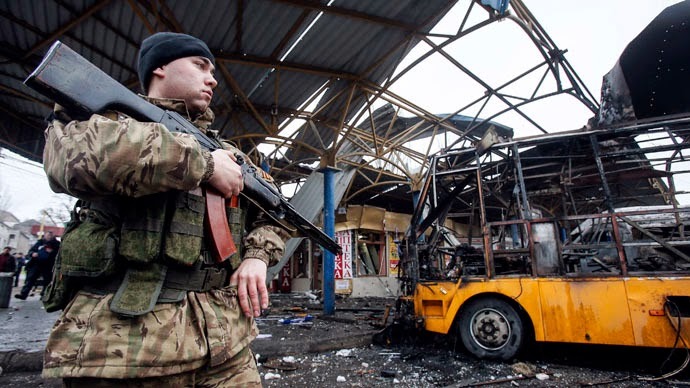 Kiev was quick to blame the rebel forces for the attack, an accusation that the militias denied, saying they had no artillery units close enough to fire at Kramatorsk. Meanwhile the rebel stronghold of Donetsk suffered yet another shelling by artillery, which they blamed on an infiltration group sent by Kiev. At least four people reportedly died from the attack, which hit a bus station just a few hours before the talks were scheduled to begin. Few details are known about the proposed new peace deal on the table in Minsk. It would reportedly involve a wide demilitarized zone along a disengagement line to prevent artillery attacks, political reform in Ukraine to offer wide autonomy to its dissenting regions and possibly a contingent of international peacekeepers to monitor the situation. If the talks do produce a truce document, implementing it in practice would be a challenge on its own. The alternative to striking a deal, however, is further escalation of the conflict. The US and some European countries, such as Britain and Poland, said they were considering supplying arms to Ukraine. European heavyweights Germany and France, as well as several other EU members, spoke sharply against such a move. The West’s arming Kiev is bound to further alienate Moscow, which already sees some of the troops fighting for Kiev as “a NATO legion,” to cite President Putin. Kiev and some Western nations accuse Russia of fanning the flames in Ukraine by supporting the rebels, providing them arms and sending troops to fight by their side. Moscow denies the accusation and blame Washington’s unconditional support of Kiev’s aggressive policies for the continued hostilities.